Cropped from full page. L'Opinione: Il Departmento Circolazione. 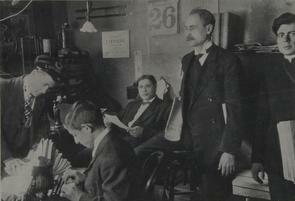 Circulation department from "L'Opinione" newspaper. Five men, one at typewriter, one in cap, several carrying newspapers.